Today’s high tech electronics require space saving, low cost methods for connecting and testing circuitry. 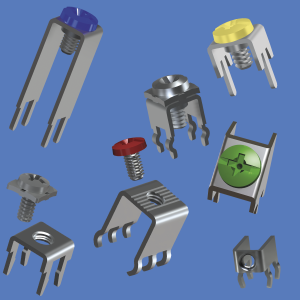 Our complete line of Quick Fit terminals, Screw Terminals, Solder Lugs and Test Points and Jumpers are designed to meet the interconnect and testing challenges for electronic and electrical component termination points. New series of “True” Zero Ohm high current SMT Jumpers, designed to replace Zero Ohm resistors without changing board designs or layouts. These new devices are uniquely suited as true zero ohm resistor replacements. Manufactured from Copper with Silver plate, these jumpers are designed to provide a low impedance and profile circuit linkage with an identical footprint as a 0 ohm resistor. They are ideally suited for high-density, high current PCB packages on power and aluminum backplanes. All PCB soldering applications, including reflow, may be utilized. Jumpers are packaged on tape and reel per ANSI/EIA-481 standard for compatibility with most vacuum and mechanical pick and place assembly systems. The resistance is 0.2 milliohms maximum under the following conditions: 0.5 Watts at 70º C., with a current of 20AMP and a connection temperature at 105º C. or less. Three jumpers sizes for the different resistor chip sizes are offered (0603, 0805, 1206) to simplify designs and footprint template compatibility. The Micro-Miniature Test Points are manufactured using Silver plated 0.25 thick Phosphor Bronze, and are supplied on an 8mm wide; 4mm pitch; conductive polycarbonate tape that meets ANSI/EIA-481 standards. Parts are packaged on either 7 inch reels – 1000 pieces per reel or on 13 inch reels – 5000 pieces per reel. The Compact and Miniature Test Points are manufactured using Silver plated 0.38 thick Phosphor Bronze, and are supplied on a 12mm wide; 4mm pitch; conductive polycarbonate tape that meets ANSI/EIA-481 standards. Parts are packaged on either 7 inch reels – 1000 pieces per reel or on 13 inch reels – 5000 pieces per reel. Available in Miniature, Compact, Multipurpose and Ultra Low Configurations. Color Coded for easy identification, these “loop type” PCB mountable terminals are an economical choice for test terminations. Featuring snap-in mounting and an integral plastic base, terminals are positively retained for wave soldering. Miniature, compact and multipurpose loop styles permit non-slip, safe circuit testing using J hooks, EZ hooks, grabbers, alligator clips, tips or probes. Ultra-low and low profile designs are available to meet high density PCB applications; high profile for difficult to reach applications. 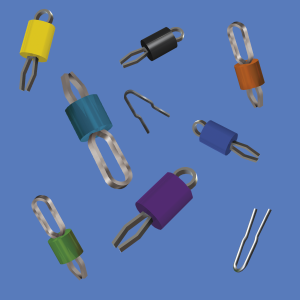 “loop type” terminals are a practical alternative to wire-wrap posts and turret terminals. • Terminal : Phosphor Bronze, Silver Plated. • Base : High Temperature nylon, UL 94V-0 rated. • Color Choice : Red, Black, White, Orange, Yellow, Brown, Green, Blue, Grey and Violet. • Other colors are available on special order. • for 1.57mm or 2.36mm PCB. 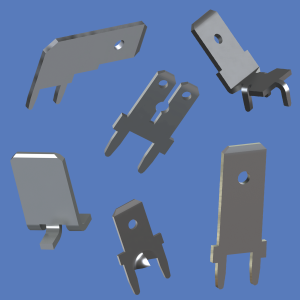 Expanded selection of horizontal, vertical, extended and 45° Screw Terminal Connectors to include “Snap-In” and “Press-In” PC Thru-Hole Mount styles. These multipurpose connectors are a practical, economical alternative to screw type edge connectors, barrier blocks, screw terminal boards and terminal strips. They are manufactured from 0.80mm thick Brass, Tin plated and are supplied with 6-32 x 1/4″ or M3 Brass, Nickel plated, binding head screws. The screws are supplied either unassembled or installed and captivated. A 30 Amp Heavy Duty version is also available with a 10-32 x 3/8″, M4 or M5 Stainless Steel screw, supplied either assembled or unassembled. Our Screw terminals are now available with color coded screws for enhanced visual identification. Supplied assembled and captivated on the terminal body or unassembled. Simply add the color screw suffix to a standard terminal p/n to create the desired color coded terminal. Color Head Binding Screws, 6-32 x 1/4″, M3 or M4 Brass, Nickel plated, binding head screws are now also available with painted, color heads which are ideal for replacement of screws where quick, visual identification is critical. Assorted screw colors are: Red (p/ns 9190-2 , 9191-2, 9192-2), Black (p/ns 9190-3, 9191-3, 9192-3), White (p/ns 9190-4, 9191-4, 9192-4), Blue (p/ns 9190-5, 9191-5, 9192-5), Green (p/ns 9190-6, 9191-6, 9192-6) and Yellow (p/ns 9190-7, 9191-7, 9192-7). These screws can also be used to create Color Coded Screw Terminals. Screw terminals can also be supplied with a Sems Screw assembled and captivated on the terminal body or unassembled. Simply add a suffix “Sems” to the standard terminal p/n. Combination Sems Screw, 6-32 x 1/4″ or M3 Steel, Nickel plated combination head screw with built in lock washer are ideal for making product assembly more cost effective and enhanced connectivity. P/n9920 or 9923 for the screw only. UL Recognized Male PCB Terminals. 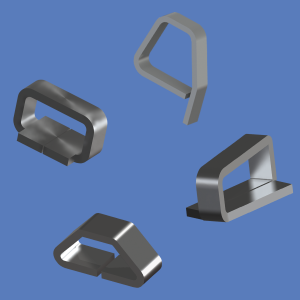 For .110″, .187″, .205″ and .250″ Mating Terminals Available in Horizontal and Vertical Configurations. 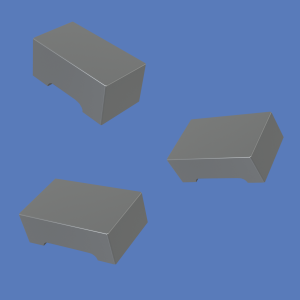 Highlighting the Keystone line is a group of PCB Quick-Fit terminals that feature .110″, .187″, .205″ and .250″ male tabs (2.79 mm, 4.75mm, 5.20mm and 6.35mm). Manufactured from .020″ and .032″ thick (0.51 and 0.81mm) brass with tin finish, they’re available in both horizontal and vertical configurations. Their space saving design makes them ideal for use in dense areas and offers easy access for connecting and disconnecting Quick-fit female terminals. “Sturdi-Mount” PCB Quick-Fit Male Terminals. The new product line includes both .187″, .205″ and .250″ (4.75mm, 5.20mm and 6.35mm) PCB Male Quick-Fit terminals. Manufactured from brass with tin finish, the terminals feature Keystone’s unique “Sturdi-Mount” bases which dramatically increases terminal strength and stability. Terminals remain perpendicular to the PCB and stay parallel to adjacent terminals. The enhanced mounting minimizes the likelihood of terminal and/or solder joint fracture due to rough handling or forces applied during terminal mating. UL file number E201546. They meet the dimensional and functional requirements of the National Electrical Manufacturers Association specification number NEMA2-1982-(1988) and UL310.